I need 2 Rivets for my motor tag. Just under a quarter inch long and I attached an image of the width. I can't seem to find anywhere that sells them. Please help! Thank you, I will check them out. You might try for brass escutcheon pins at your hardware store. They may have them in those drawer things. Also look into brass round head rivets. Great idea! I will head to an ace hardware to see this weekend. Do you know if home depot may have them as well? What fan are these for. And diameter also will help us figure out what you need. If I have them, I’ll gladly drop them in an envelope, but need to know exactly what you need. And they can’t go out until next weekend. The diameter is 0.20 cm and it's for a Robbins and Meyers 3600 9 inch fan. I’ll” see what I have, but unfortunately I won’t be able to check until next weekend. Thank you very much Lane! If I come up empty handed on a drive rivet, an escutcheon pin might work as Steve said. They’re available at the hardware store. Just trim the length with a wire cutter and leave enough to tightly bend them over on the back side. That’s how the older Emerson tags are fastened. I'll be headed to ace sometime this week hoping they have some just in case. I still have a bunch of work before completing the restoration. 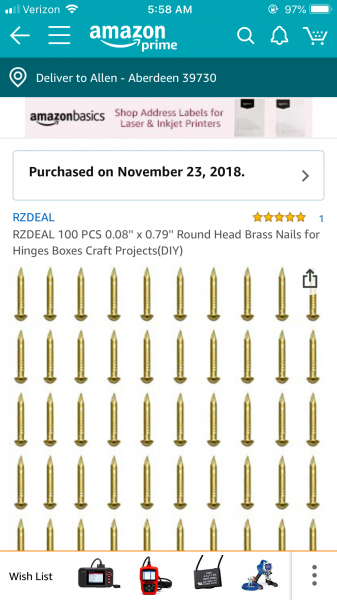 I bought these on Amazon. They’re soft brass that is easily cut and peined flat with a hammer. The head is also a nice round shape. Works perfectly. Thank you for the idea Allen! Page processed in 0.2670 seconds (44% database + 56% PHP). 27 queries executed.